Lymph node dissection is a crucial procedure for curative resection of gastric cancer . 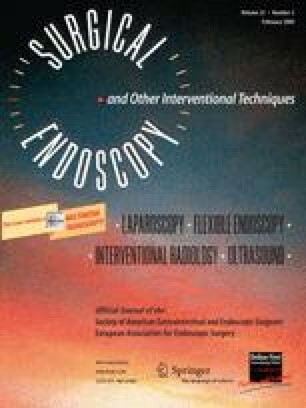 To avoid portal vein injury during laparoscopic extended lymph node dissection for gastric cancer, taping of the common hepatic artery and subsequent confirmation of the portal vein have been recommended [2, 3]. This taping method, however, makes laparoscopic nodal dissection technically complicated. This study introduces a novel procedure for safe and simple laparoscopic suprapancreatic nodal dissection without taping of the common hepatic artery. The authors’ novel, simplified method consists of four steps: (1) dissection along the cranial edge of the pancreas from right to left, (2) dissection along the splenic artery with exposure of the left renal fascia, (3) dissection along the left gastric and the common hepatic arteries, and (4) retraction of the lymph nodes surrounding the common and proper hepatic arteries and their complete dissection from the portal vein. This procedure is reversely directed compared with conventional open gastrectomy (i.e., the nodal dissection is from left to right). For this study, the lymph node stations and groups were defined according to the 13th edition of the Japanese Classification for Gastric Carcinoma. The described procedures were performed for 58 consecutive patients with gastric cancer. The indication for this operation is primary T1/T2 gastric cancer without clinical nodal metastasis. In all cases, safely extended suprapancreatic lymph node dissection was successfully accomplished using the described technique. A total of 43.5 ± 18 lymph nodes were retrieved, including 14.4 ± 6.3 second-tier lymph nodes. The overall number of retrieved lymph nodes in this study was similar to that reported previously . Postoperative morbidity occurred at a rate of 22.3%, and the mortality rate was 0%. There was no conversion to open surgery. The mean blood loss was 127 ml (range, 0–490 ml), and the mean operative time was 289 min (range, 104–416 min) in the last 20 consecutive cases. To date, no tumor recurrence has been observed. The median postoperative observation period was 1.4 years (range, 0.4–2.4 years). The described novel procedure would be sufficient and convenient for dissection of the suprapancreatic lymph nodes. The online version of this article (doi: 10.1007/s00464-008-9978-9) contains supplementary material, which is available to authorized users.